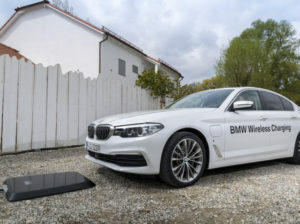 BMW is introducing wireless, inductive charging for the 530e iPerformance model from next month. Available as an option, the technology uses a ‘GroundPad’ base pad, which is fitted in a garage or drive, and a CarPad on the underneath of the car. The charging process starts automatically once the vehicle is in position – with the system providing guidance on parking right – and takes around 3.5 hours for a full charge on 3.2 kW power. Once the battery is fully charged, the system switches off automatically. Production will start in July and the system will be available on lease in Germany first, followed by the UK, the UK, the US, Japan and China.